Built at Kirn in 1903 by James Litster and designed by Mr. William Bergius. 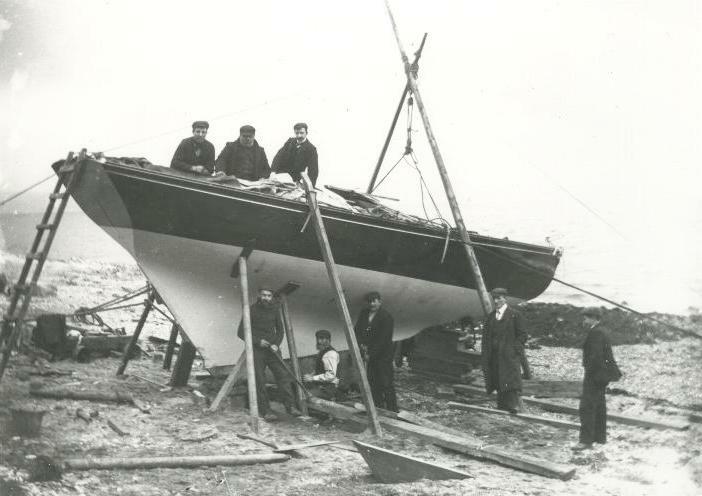 This photograph was taken by Mr. William Bergius in 1906 and shows the boat on the beach at Hunter's Quay, near Kirn for the fitting of the under water parts, during the fitting of the Kelvin Engine, a 2 cylinder 3 1/2" bore 6/7hp unit and the first ever to be installed in a yacht. Dodo II is believed to be still sailing in the North Wales area, now renamed "Vegan". The engine is now in the museum of transport in Glasgow.